Our office can provide all of your family with a thorough eye exam using some of the most advanced ophthalmic instruments currently available. We test for cataracts, glaucoma, strabismus, macular degeneration and numerous other debilitating eye diseases. We will dilate your eyes to check for internal eye diseases and certain systemic diseases such as diabetes and hypertension. and any eye conditions you may have. He will also show you any pertinent treatment options and all eyeglass lens options to help you understand their importance. For patients with congenital eye color mismatch or for those who have suffered eye trauma leading to corneal scaring we can use cosmetic contacts to improve your appearance. As an example, cosmetic contacts can make a completely white eye appear normal cosmetically - restoring both eye color and a normal dark pupil centrally. In the photos above is an actual patient who had previous extensive eye surgery. Unfortunately his iris and eye color in one eye were lost post operatively. While his normal eye has a blue grey color the other appears glossy and black. Careful fitting with a prescription cosmetic contact lens restored both vision and natural eye color match. Before and after effects may not be the same with each patient or case. Dr. Adame is certified by the board of optometry to prescribe therapeutic pharmaceutical agents. If you develop a red eye or pain in the eyes, please contact our office immediately. We will determine the cause so that appropriate treatment can be given in a timely manner. For red eye related visits: Some insurance plans such as VSP may cover your red eye visit. We will gladly call your insurance to see if your urgent visit is covered. We can evaluate your eyes and determine if you are first and foremost a good contact lens candidate. If so, eye measurements, a trial fitting and prescription refinements are performed to determine the contact lens type that gives you the best visual acuity, comfort and wearing schedule. Our technicians will then educate you on the handling and day-to-day care of your contacts. A relatively new option to glasses or contact lenses is LASIK eye surgery. LASIK is the most current type of corrective vision surgery performed today. With newer technology, there are many options with respect refractive surgery. If you are interested in surgery, we will first determine if you are a good candidate and discuss with you all of your surgical options. Should you opt for refractive surgery, Dr. Adame will perform the necessary pre-operative tests and refer you to the N-Vision Laser Centers in Brea (California), where you will go for the LASIK procedure. After the surgery, Dr. Adame will co-manage your post-operative care for a period of one year. 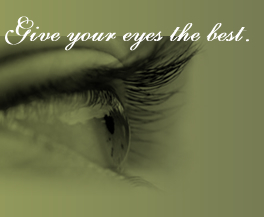 This will insure that your eyes are healing properly and that you maintain excellent vision. To educate yourself further regarding laser eye surgery we recommend you visit the N-Vision Laser Centers website. The N-Vision Laser Centers partners with VSP to provide its patients a discount on laser surgery procedures. Digital Fundus Camera - This instrument gives Dr. Adame a clear view of the interior of your eyes. It is sometimes the only way to examine young children. 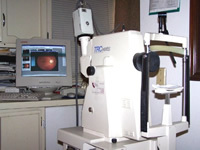 Corneal Topographer - Dr. Adame uses a corneal topographer to help monitor the cornea of your eye. This technology is helpful in early detection of eye disease, contact lens fitting, and preoperative tests for LASIK patients. Ultrasonic Pachymeter - This instrument is used for preoperative care of LASIK patients to accurately measure intraocular pressure (pressure within the eye). 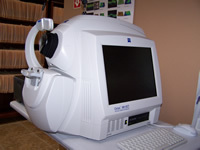 Zeiss Matrix Perimeter - Dr. Adame uses this instrument to identify peripheral field loss, which can be caused by glaucoma, brain lesions, strokes, and many other eye and systemic diseases. 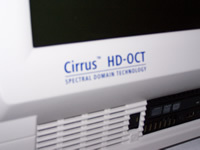 Cirrus HD-OCT Model 4000 - (shown below)The first choice OCT for the full spectrum of patient care. With built-in Line Scanning Ophthalmoscope (LSO) in addition to the OCT engine, Model 4000 provides Dr. Adame maximum diagnostic power and patient throughput.